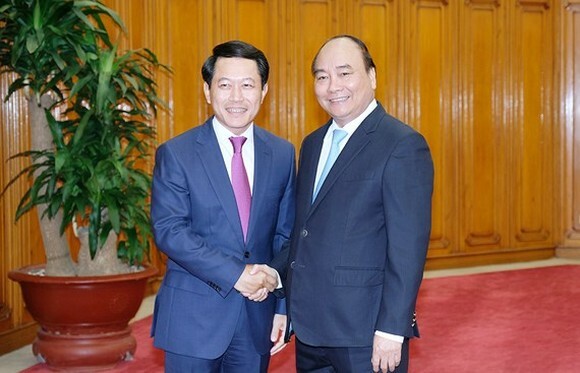 Vietnamese Prime Minister Nguyen Xuan Phuc received Foreign Affairs Minister of Laos Saleumxay Kommasith at the Governmental Office in Hanoi yesterday. At the meeting, PM Nguyen Xuan Phuc expressed his pleasure of attendance of Laotian minister Saleumxay Kommasith and the country’s diplomatic delegation at Vietnam- Laos annual ministerial meeting to counsel as well as exchange cooperation between the nations' diplomatic ministries. Besides that, he also congratulated the Laotian and Vietnamese ministers of foreign affairs on the success of consultation and working and sharing that the effective consultation mechanisms helped the two ministries collaborate closely and complete missions of parties, governments and people of the two countries. PM Phuc suggested the nation’s ministries of foreign affairs needed to strengthen further mutual cooperation and information share.